Hello all, I wanted a place to call my own. I've been lurking on these threads since before NLA. I've never participated and quite frankly regret that immensely because I have seen those that do lap me many times over in their trading knowledge. So this will be a place where I document my trades and thought processes completely and I hope to gain something out of the practice. Please don't hesitate to contribute if you would like. Thanks to the community at large. This was my first trade back after an extended break where I got my life in order and became a functioning adult vs a chart junkie. Some may think it was the wrong direction but I assure you it had to happen. Anyway, looking at the long term chart I saw that AUDUSD was coming back into support/ a ZL for those who where able to get out of the first correction. I entered at a spot I thought was a good support but price made a huge move against me, however this was within (to the max) my if/then and I was able to ride it out and price eventually went my way. My thinking was "it has to make a higher high" on the daily+ chart. I entered at the bottom blue line and hedged at the top fully expecting to get back in at a lower price and start my first trade with a good bit of space. Everything worked out for that first one and I was feeling good! So this trade was made as a continuation of the first looking to take the AU to a higher high. I should have know by PA that I could have been wrong but unfortunately it didn't happen. I jumped in at the top blue line long because I saw it breaking under the previous correction (running stops) and into the general support zone at the thick magenta line. Admitedly it wasn't a precise entry but I had some space and expected an eventual move higher. I stopped out at the lower blue line after it did NOT turn around . I gave back most of my space but still had about 23 pips of space left. Which I thought was great, no big deal and onto the next. 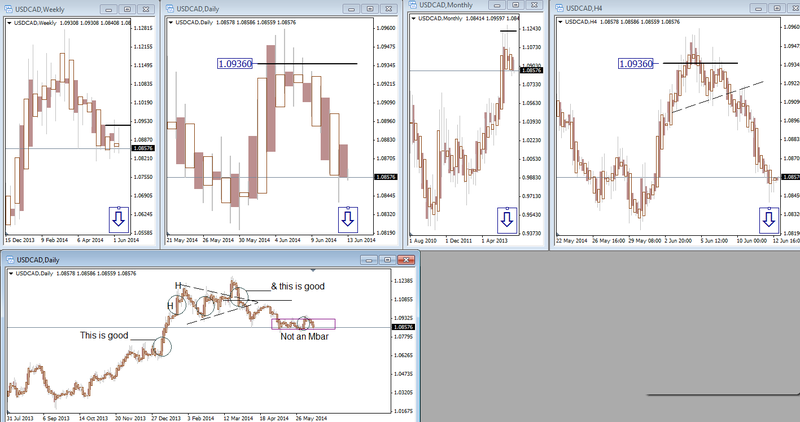 Next was my thinking that the EURUSD was going to break to new highs on the LT chart (what I believe I should be focusing on when selecting a trade, a BIG one that is going to move hundreds of pips). I saw the previous extreme and according to MO that is a great place to decide where to be long or short from. I also saw what I thought would be support right at this level and a lot of people had been shaken out (see top blue line on Daily chart). So I zoomed my analysis into the 1 HR and I saw that big wick and thought "Nice, showing weakness right where I thought". Price bounced along and found support once, price came back and found support after making a fake break of that previous low. Great, I entered at the blue arrow/line long after price had "closed over" "something" (what I had thought was a ZL easier seen on the 5/15 min chart). Of course after I did this (pretty sure it was my order ) it turned out to be a fake break and zoomed lower. I thought no problem, I had sized my space for a LT chart so I assumed they were going to target the stops resting under the previous wick and I drew the red line in assuming it would go beyond and then we'd get long (daily chart was still very wicky and hadn't closed against me although this midnight was rapidly approaching). Sure enuough price wick that line and started closing higher than what I thought was "something". Of course you can see that this didn't happen and when price fully closed lower (I woke up a 3:11 and this is where the trade was) I closed the trade at the lower blue line/arrow. s**t, I was now eating into my money/space not OPM! Now, to bring this thread up to speed I am currently in this trade. I am watching the UJ. I see this daily chart and first thing that I see is support that is far too good looking for my taste. I also see that price hasn't closed higher yet and I will remain short until it does. Please ignore the angle lines as that is something that I'm trying to watch that MO has shown and I have no idea how to do it so I barely watch them. 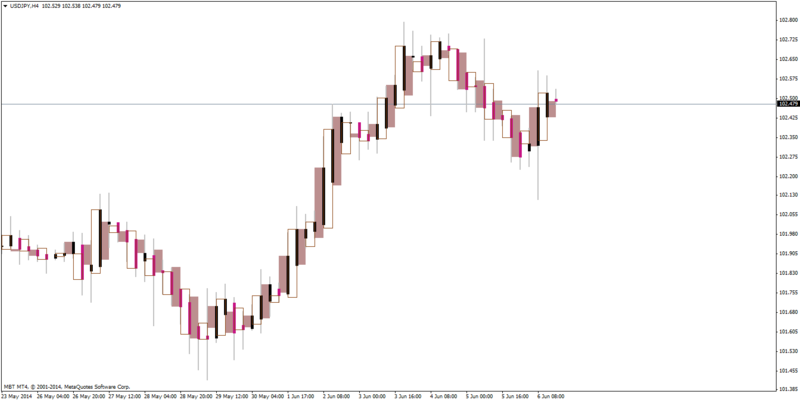 But again, that is my bias, a big chart that has a move that if I'm right will be good for 100+ of pips. So I have zoomed into the 1 hr chart and first of all the red line is a pivot I am looking at from the previous price action. Also (coincidence I'm sure) makes a nice ZL. The first stab I took at it it went against me (surprise! ). I saw price closing lower that "something". I saw price pull back into this area and wick it which I thought was going to be a ZL, but price eventually shot through and "learning my lesson" from the EURUSD trade I closed it for -17. Price proceeded to make a higher high and run stops and I entered again. It was a perfect entry on the second chart and I hedged it perfectly. If price could just do this everytime I'd be golden. I am currently hedged and waiting to get wicked back in with the 2/3 of a position that I took off at the hedge of 101.463. I had the programmer code the indicator over the HA, to make sure that she coded it correctly, but it is supposed to be viewed without the underlying HA. Attached are the two indicators that I use most often. Here is the update for that last trade. I had 1/3 still in which was my original entry at the lower red line. I then unwound my hedge with the additional 2/3 at the higher red line. There were stops resting behind the arrow so I thought it would be a good place to jump back short. Unfortunately that was the wrong answer. I exited all at the blue line. I lost less than I made on the hedge down, but am still negative total. Latest trade. Was feeling really good about this one. Was looking to gain position on the long term chart and wait for price to make a higher high. I saw price make a momo move up from a double bottom. I was going to get long at the bounce on the close of the momo move up (blue area). I tried to really focus on where the orders would be for anyone who was able to get long on the move up. Right below that area I had a ZL for the break out traders (red line), so I figured between the 2 I had the area covered. I entered at the high blue line and closed at the low on the two arrow marked candles. I've got 76% of my original space left after this trade. I need to catch a real move.